The Affect Balance Scale (ABS) is aten-itemscale used to measure hedonic wellbeing in normal populations. It is composed of two5-itemsubscales: a positive and a negative scale that are statistically independent. The ABS is constructed by taking the arithmetic difference between the positive and the negative scales and transforming the result to be a positive number. The combined scale can be used as a dependent variable in research on subjective wellbeing. Thesub-scalescan be used separately to investigate components of hedonic wellbeing that are related to experiences in everyday life. 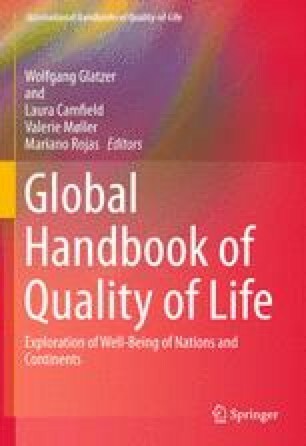 This chapter reviews briefly the historical and theoretical context for the development of the concept of subjective wellbeing, the creation and validation of the Affect Balance Scale (ABS) and discusses some current issues surrounding its conceptual status and use. Portions of this chapter are adapted from Bradburn (1969). The author wishes to thank Ms Jennifer Gulyas for her assistance in preparing this chapter.